"When I received a solicitor’s letter," said Paul O’Brien of Leeds in Great Britain, "I thought someone was having a laugh." This was because the letter explained that Mr. O’Brien was likely to be sued by a woman who had injured herself while putting junk mail through the slot in his front door. 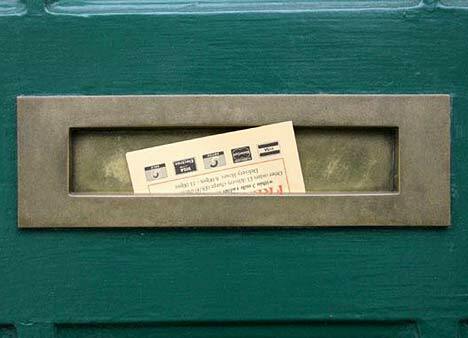 The letter stated, "We understand that the circumstances of the accident are that our client was delivering a leaflet to your house when your letterbox snapped back on to her right index finger. As a result of this, our client suffered from personal injury and loss." The treacherous letterbox appears to have been what Americans would call a "mail slot" with a swinging door. Joy Goodman claims that the tip of her right index finger was actually severed by the letterbox door, and that consequently she can no longer work as a cake decorator. "I just cannot believe," O’Brien said, that "someone who came on to my property uninvited, to put junk mail through my door that I didn’t want, can now sue me because she hurt herself." The letter apparently did not claim that O’Brien had somehow been negligent or that the letterbox was defective in any way. "I asked the Royal Mail if they had had any problems with it," O’Brien said. "They said they hadn’t and that in any case their staff are trained to make sure they don’t get hurt while delivering." The report did not provide details about what training Royal Mailmen might need to avoid losing a finger when poking a letter through a slot, but the Cake Decorators and Junk Mail Deliverers’ Union may want to look into that. The letter did not make a specific claim for damages, and Goodman declined to comment, saying that the matter "is in the hands of my solicitors." Maybe that’s the problem, O’Brien said. "It seems like we’re becoming more and more like America," he complained. "Everyone wants compensation."